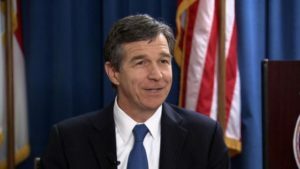 The law firm hired to defend the North Carolina Board of Elections in the current gubernatorial recount has solid ties to Democratic candidate Roy Cooper, a report said. Cooper earlier this month had announced that two members of the Brooks Pierce McLendon Humphrey & Leonard law firm would be part of his transition team, American Lens reported on Nov. 29. One of the two, Kristi Jones, also served at the NC Department of Justice for over 10 years as Cooper’s chief of staff, the report said. Campaign donation filings for Cooper show that 23 separate individuals listing their employer as Brooks Pierce donated to his campaign as of 3rd quarter of 2016, totaling $31,015.19. Filings for the McCrory campaign showed only one general contribution from Brooks Pierce for a total of $6,500. The American Lens report said that the firm has litigated on behalf of the state but has also sued the state. In 2015, Brooks Pierce joined the Southern Coalition for Justice and six private citizens in a suit against the city of Greensboro over redistricting.